Holy smokes, it’s been quite a minute! Merry belated Christmas and Happy New Year! Seriously, I cannot even begin to express how happy I am that it is in fact, 2017. How incredibly amazing is it that we get to see another year begin? I will go ahead and brag that 2016 was by far a year of extreme blessings. Caleb and I finally moved into our first home together, we were showered with love by friends and family—all year long, and we vowed our lives to one another on the most beautiful October day, at the move beautiful Texas Hill Country Winery, in front of the most beautifully special people we know. So, how can this year even compete!? Caleb and I are patiently waiting to meet the firsts of our families babies! Aubree to make her debut literally any moment now and Jaxon to kickoff, or out, this upcoming April. Although we are just one of many Aunts and Uncles, we’re beyond excited to spoil these kids with love! In other news, I hear this really important event is coming to Houston in a few weeks. Something along the lines of helmets, pads, plays, and huddles? Given that I am still not over the hurt from November followed by the tears Florida State gave us a few weeks ago, I think I may just go ahead and jump on the pro level bandwagon. At least for yummy food, of course. 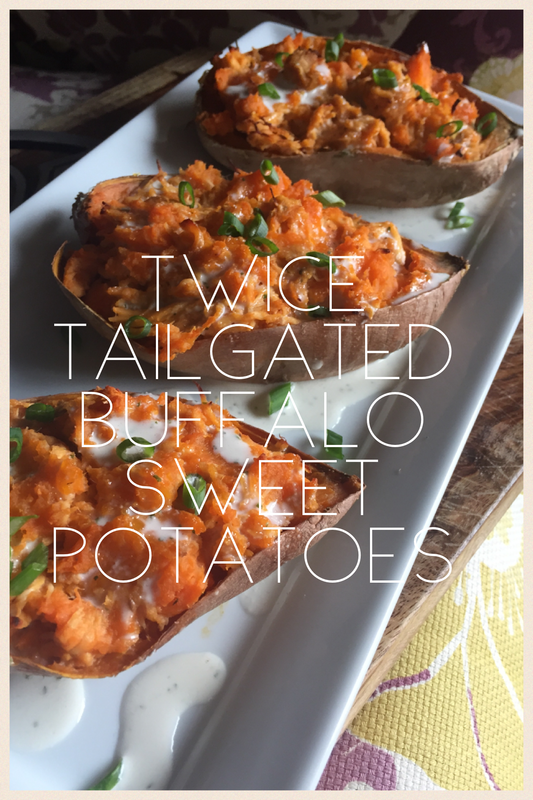 These Twice Tailgated Buffalo Sweet Potatoes are jammed packed with flavor, vitamins, and protein to help keep you calm during game time. Larger crowd? 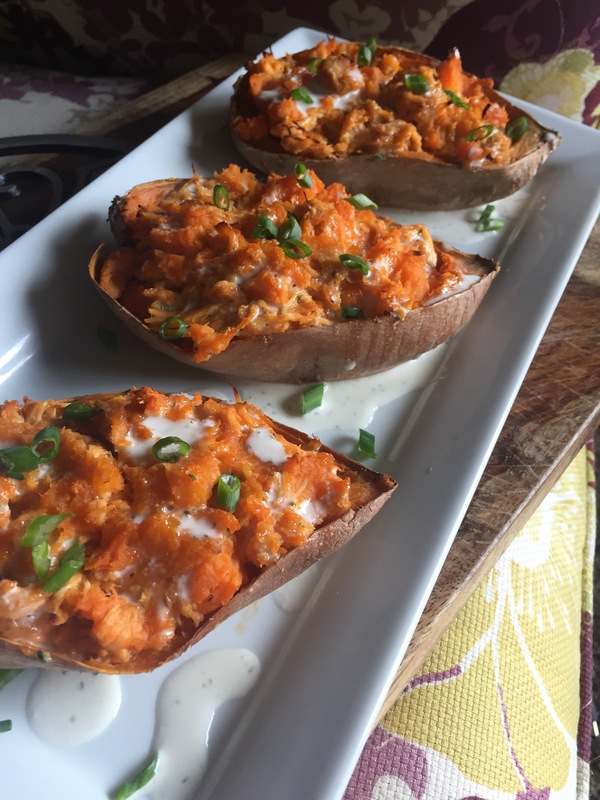 Try cutting the sweet potatoes into fourths and make them little buffalo boats for all of your guests! 1. With chicken placed in a crockpot, cover with Franks, garlic, onion, parsley, and chives. Cook on low for 8 hours or high for 4 hours while you clean and run errands. Shred and let chicken sit in the juice until ready for stuffing. 2. Cook chicken however you normally would. Shred and place in a large skillet or pot on medium to low heat. Season with Franks, garlic powder, onion powder, parsley, and chives. Continue cooking on low heat for 10 minutes. 2. Line baking sheet with parchment paper and place sweet potatoes face down. Bake for 30 minutes or until soft. 3. Let cool and scoop majority of sweet potato out of skin being careful not to break through the bottom. 4. 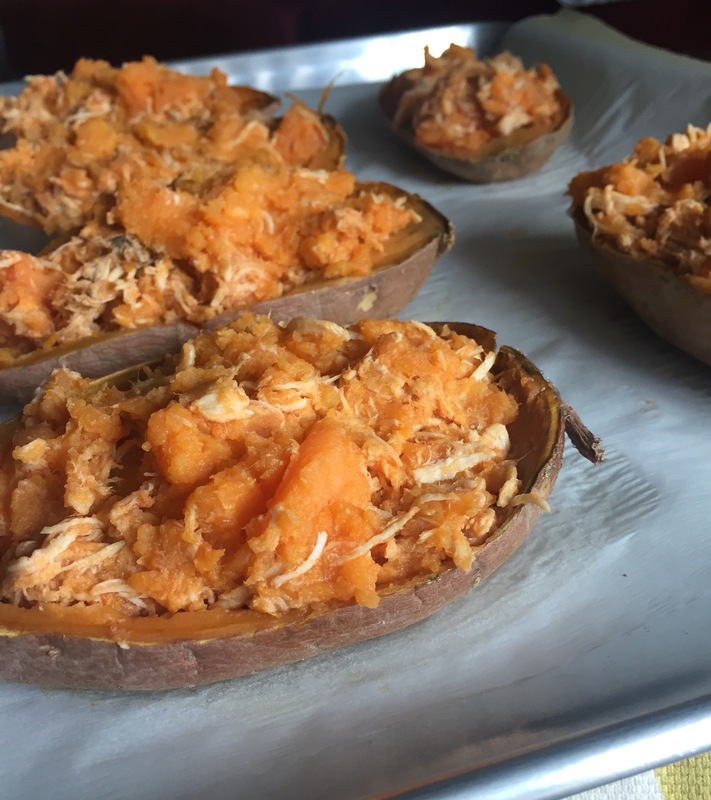 In a large bowl, combine the removed sweet potato with shredded chicken. 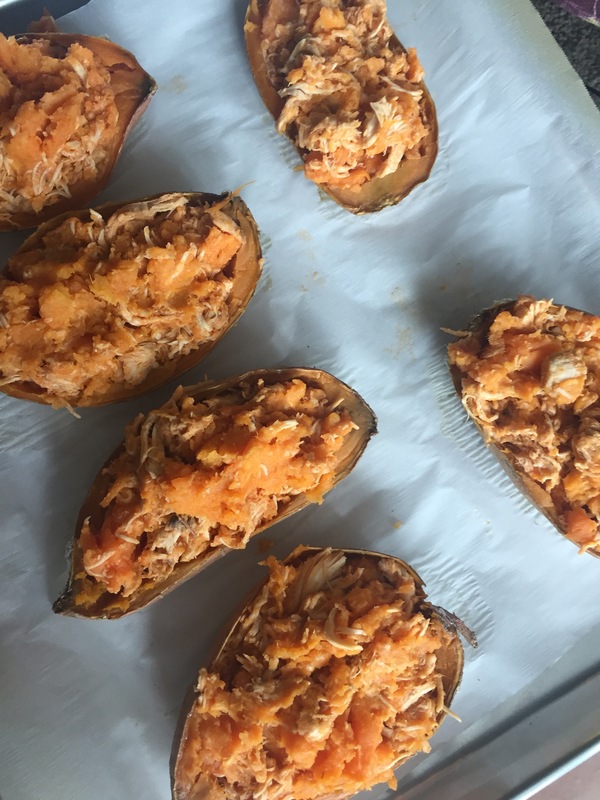 With a spoon, stuff sweet potato skins until all of the mixture is used. Return to oven and bake for 20 minutes. 5. Drizzle with your favorite ranch and a sprinkle of fresh chives. Combine all ingredients and blend with an immersion blender until all seasons are incorporated. Store in a mason jar for up to 1 week in your fridge. I hope you have the most miraculous day!